In his 64 years calling Dodgers games, Scully has never been prone to hyperbole. When a truly special moment happens, sure, he’ll deliver as stirring a description as you’ll ever hear. But he understands context. 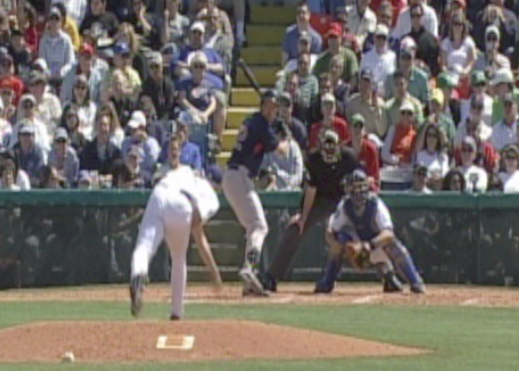 A random pitch in a random spring training game isn’t usually going to make him jump out of his chair. But this was no ordinary pitch. Kershaw’s curveball was a masterpiece, falling out of the sky and turning Casey’s knees into spaghetti. Jon Weisman was watching the game at home. The proprietor of the excellent blog Dodger Thoughts, Weisman was excited to see Kershaw’s first TV appearance in a Dodgers uniform. The moment that pitch landed for strike three, Weisman knew he had to watch it again. And again. Over and over, he kept rewinding, then rewatching, rewinding, rewatching. Finally, he decided to post the clip on YouTube. Dodger Thoughts had a healthy audience at the time. But Weisman wasn’t on Facebook or Twitter. All he had were his blog readers, this one pitch, and Vin Scully’s call. As the day wore on, people started to notice. Yahoo picked up the clip and gave it some play. The views started piling up. A medium-quality recording off a blogger’s TV of a random pitch in a random spring training game, and 659,000 people had watched it. In two days. By the time Major League Baseball pulled the clip for copyright violation (as has been their wont), it had racked up more than 750,000 views. I still remember the afternoon. It doesn’t feel like yesterday, to be honest. It feels like 10 years – 10 rich, ridiculous years. We’ll keep the clip up here for a few hours at least, before I offend the powers that be.